Adventic. An unusual sounding name for a rather uncommon model: the first Eterna timepiece to incorporate the new Eterna proprietary calibre 3843, itself energized by an Eterna Spherodrive mechanism. This new round self-winding movement follows the introduction of hand-wound calibres 3505 and 3510. Providing the time of day with running-seconds subdial plus the date and GMT time, it now equips a design inspired to some extent by a Centenaire model of the 1960s, yet perfectly contemporary in style and spirit. This stylishly trim design will be available in autumn 2012 from selected Eterna dealers. 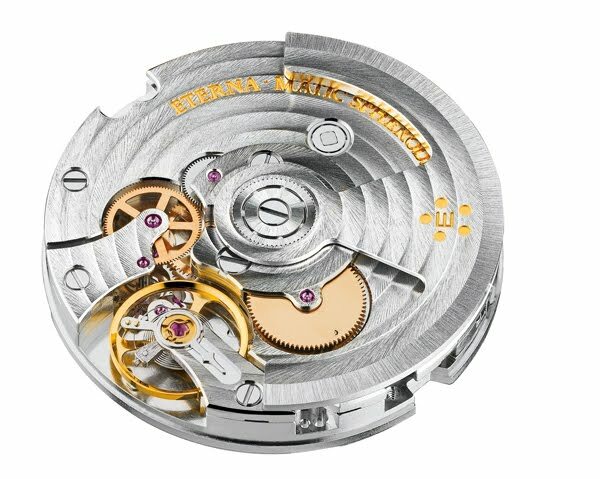 Eterna proprietary calibre 3843; self-winding movement fitted with Eterna Spherodrive system; power reserve 72 h; 28,800 v.p.h. ; 26 jewels; diameter: 30 mm (13 ¼ lines); 3 ball bearings; Glucydur balance wheel; hours and minutes, running second subdial; GMT counter; date calendar. 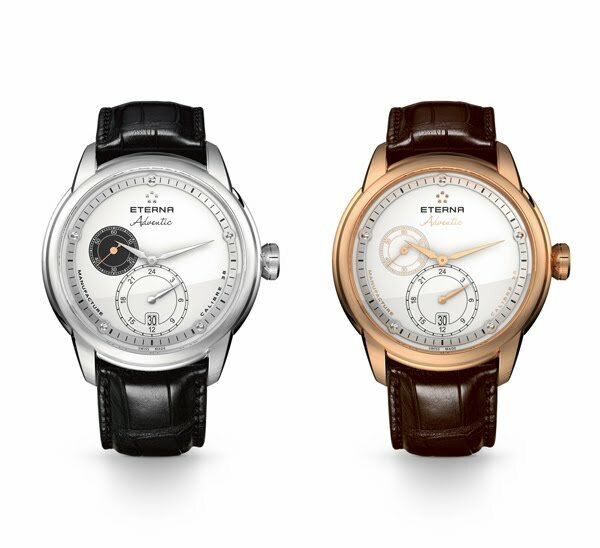 white or black, baton hour markers on circular satin-finished rhodium-plated or dark rhodium-plated applied minute ring enhanced with five polished spheres; rhodium-plated or gold-coloured centre hour and minute hands; black or white seconds subdial with gold-coloured or blued hand; date calendar at 6 o’clock; GMT counter at 6 o’clock with rhodium-plated or gold-coloured pointer. Case in polished and satin-finished stainless steel or in polished and satin-finished 4N pink gold enhanced by two parallel sets of five micro-grooves engraved on the case flanks; case back secured by 5 screws with sapphire crystal opening; water-resistant to 50 m (~ 165 feet or 5 bars); diameter: 44 mm; height: 12.5 mm; scratch-resistant, anti-reflective on both sides sapphire crystal; crown featuring the five-sphere symbol. Fitted black or brown alligator leather strap with polished stainless steel or 4N rose gold folding clasp.